www.elca.org is the website and home page for the Evangelical Lutheran Church in America. It provides news and events and other resources related to the ELCA. www.thelutheran.org is the official magazine of the ELCA online. www.lcna.org: ‘Reconciling in Christ’ is a program of Lutherans Concerned/North America engaged in inclusive ministry. www.netministries.org: Basics provides an overview of the Bible and each book, including pronunciations and links to more detailed information. 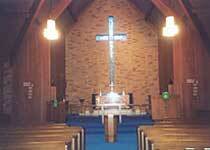 www.thrivent.com is a family of financial services for Lutherans.